As I sit with my computer to write, I'm listening to my husband reading to our three children in the next room. Not only is the story filled with funny character voices, but over the top of them I can hear giggles and questions from the little ones sitting on his lap. My husband is an incredible dad. I don't tell him that enough. It's too easy when we live with someone day after day, year after year, to knit pick apart their flaws and their imperfections. It's all too easy to look at our husbands and see the areas where they need to improve and work harder. But how often are we speaking life and encouragement into the men who lead our families each day? How often do we take a step back and appreciate the joy and blessings they bring into our lives and the lives of our children? 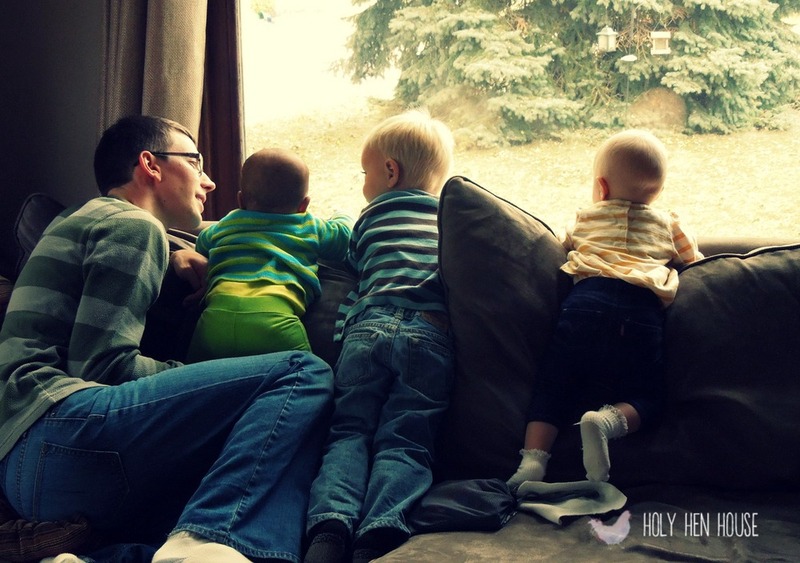 How often do we let go of the steering wheel and give our husbands the chance to drive the direction of our families? Let's face it, as women we have a habit of taking charge and making things happen in our way and our timing (this is no new thing, it's evident all the way back to good ol' Eve in the garden). And when our hubbies don't do things the way we would have; when they approach a situation differently, it's way too easy to step in and tell them what they did wrong and how they could improve. However, our husbands don't need us to be their coach. They need us to be their biggest fan and encourager. And, most importantly they need us to be their biggest prayer support. If there are areas where your husband needs to change, get down on your knees for him daily and trust God to do the changing. Open the Word of God together and let God teach him how to be a better father, leader and friend. Encourage him to take time during the day to have personal time for Bible reading and prayer. Find opportunities to compliment and praise him, and give him opportunities to step up and lead. God didn't make a mistake when he made you and your husband into life-long teammates. God made us uniquely men and women for a reason, so take a step back and enjoy your husband for the unique joys he brings to your partnership.